Cool Hollow Polymer Clay Egg Tutorial | Science in Action! 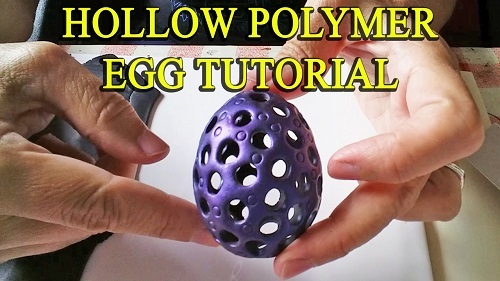 The Unruly Housewife has a cool tutorial where she shows us how to make a hollow polymer egg. This is a fun project to make decorative eggs for Easter. And perhaps remind you of egg based school science projects! She used a single color and minimal embellishments for the tutorial. But the potential is there to use all kinds of blended colors and so forth. She uses a real egg as the form. As with many Easter egg projects, the egg white and yolk is blown out by first making two holes at each end. Use a skewer to disrupt the egg material inside before blowing out. Afterwards the hollow egg is baked at low heat in the oven for a short while. This is probably a drying step as some people may also use water to rinse out the empty egg. The trickiest bit is the careful shaping of the polymer clay over the egg. Keeping the polymer clay layer consistent in thickness is one thing. Smoothing down the seams is another. Once the completed polymer clay layer has been baked, the whole thing is submerged in vinegar for several hours in order to break up the remaining eggshell. Eggshells are mostly made of calcium carbonate which reacts with acids to form calcium acetate, water and carbon dioxide. The bubbles you see in the video is the carbon dioxide being formed. Vinegar is actually a 5-20% dilution of acetic acid. Vinegar is a weak acid solution so the reaction is much slower than with strong acids. It has a really acrid smell to many people. So do the soaking in a suitable container with the lid on! Or avoid the sharp vinegar smell altogether by using citric acid powder instead. Dissolve it in water to make your own solution. Citric acid is the organic weak acid found in lemon juice (about 5-6 % citric acid). Citric acid is used in the food, pharmaceutical industries, as a household cleaner and in some crafts like the making of bath bombs! You can use warm water to dissolve the citric acid powder - that will make dissolving both the powder and the egg shell quicker. Increasing heat will hasten the reaction. However, don't heat vinegar - it will really smell!! Also change the acid solution as the instructor does - at least once. The acid gets exhausted, so you need fresh vinegar or citric acid solution to continue the dissolving. You can also prolong the soaking time to days to get the egg shells to dissolve even more. When getting the remains of the egg shell out, try rolling the polymer clay egg instead of compressing it as the instructor does if you are at all concerned about the clay egg cracking. Gently is the way to go. The part where she removes the inner membranes through one of the holes reminded one viewer of alien sci-fi movies. Me? Those icky blackhead and sebum removal videos! Here is her gorgeous floral design tutorial using extruded clay draped over the egg and then embellished. Dissolving the egg shell is as above. I do receive a small fee for any products purchased through affiliate links which are provided as resource information for readers. This goes towards the support of this blog. The opinions expressed are solely my own. They would be the same whether or not I receive any compensation. This is amazing! I hope to try it this summer. I am thinking that you could make an indentation in the clay flower centers and then after baking, add a rhinestone or a bead as accents. Have fun! I love your bling idea!